Almost Unschoolers: Happy Birthday Grandpa! If you read this blog much at all, then you know, we really love Montana. We love the climate, the scenery, the slower pace of life, and the culture in general. There aren't too many things we miss about our days in Oregon, except of course, family and friends, and being close enough to share a piece of cake with Grandpa, on his birthday. And, don't worry Grandma, we ate a piece for you, too. So sweet! I bet this made his day. Debbie - I hope so. Oh, that was so sweet. 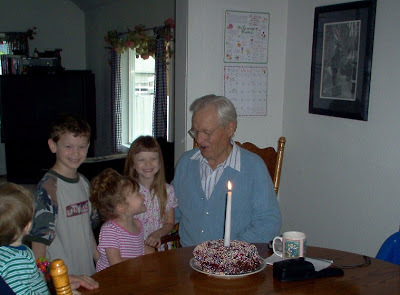 I hope he enjoyed his birthday, even if he was missing his grandchildren.